Please refer to our stock # 2020 when inquiring. 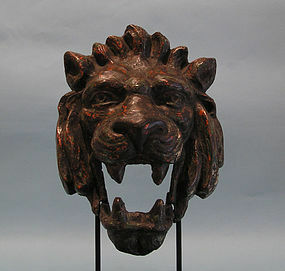 Victorian Cast Iron Articulated Lion Head from England, Circa 1850 C.E. with remains of pigment and wonderful patina. Curly mane and long fangs. Hinged at the jars for articulation and on custom stand. Mask is 13" high. In excellent condition.Ex: Windsor Antiques, New York. According to Maya Muratov of the Metropolitan Museum of Art, articulation can be traced back to the ancient Greeks. Among the numerous types of Greek terracotta figurines, one group stands out. These are figurines with jointed or movable limbs; this means that their legs, arms and sometimes even heads were made separately and attached to the body after firing. Statuettes of this type represent a class common all over the Greek and Roman world during all periods. Such figurines existed in Greece as early as the tenth century B.C., were widely popular in Cyprus from the eighth century B.C. onward and continued down through the Roman period.